Varsity baseball returns with several players from last year's historic championship season. The pitching staff will be anchored by seniors George Stiuso, Ryan Chestnutt and Neil Ianniello as well as junior Cameron Miller. Other key returning players from last year’s lineup include James Raia '16, Dan Sivolella '16, Matt Taylor '16, Cameron Gateman '17 and Ryan Morash '18. 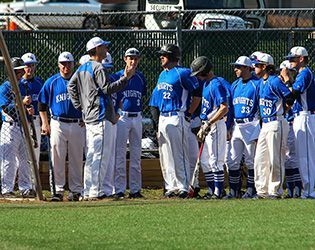 In 2015 the Knights set a school record for wins in a season (21) and captured conference and Prep B championships along the way. An influx of some new players will try to help the returning starters push GSB to new heights this spring. This season opened with a decisive 13-1 at-home win over Manville on Tuesday April 5. Stay tuned for more season previews in the days ahead. Go Knights!